Today I scratched and scraped off a 50 year old paper slip to get closer to a secret… A secret related to what Urasoe, Sueyoshi, Sesoko, Soeishi, and Shiishi no Kon have in common. And what not. In 1964, the original edition of Taira Shinken’s “Ryūkyū Kobudō Taikan” (Encyclopedia of Ancient Ryūkyūan Martial Arts with Weaponry) was published. It was the first ever attempt to publish a monograph solely concerned with Ryūkyū Kobudō. The term Ryūkyū Kobudō does not refer to all schools of ancient Ryūkyūan martial arts with weaponry. Rather, it decidedly refers to the syllabus researched and established by Taira Shinken. At the time of its publication, due to the rush in publication numerous writing and printing errors occurred. Moreover, there are also mistakes in the contents, some of which still cause a headache 50 years later. To begin with, I am in the fortunate, unique, and expensive position of owning two specimens of the original 1964 edition of Taira’s Ryūkyū Kobudō Taikan. In one of these two, a correction sheet is found glued in. In the other it’s not, neither are there signs of glue. Obviously, and while this publication was already limited to comparatively few printed copies anyway, this correction sheet was not included in all of the copies, or it got lost. In the original 1964 edition, a kata of bōjutsu (fencing with the long staff) is presented on pages 54 – 65, performed by Taira Shinken. It is shown in 61 photographs, each of which is accompanied by a text describing the respective actions. This kata is known today as Sueyoshi no Kon. I say “known today” for a reason. According to the postscript by the publisher Kogure Takehide, it was not possible to collect all kata of Taira Shinken in this one single volume. Therefore, the Ryūkyū Kobudō Taikan was actually planned as a series of five volumes, each with a individual volume name: 1) Kan no maki. 2) Gen no maki. 3) Kō no maki. 4) Ri no maki. 5) Tei no maki. However, only the first of these volumes was ever published, and this is the Ryūkyū Kobudō Taikan (Kan no maki) we are talking about. The five planned volumes, each with their respective kata. 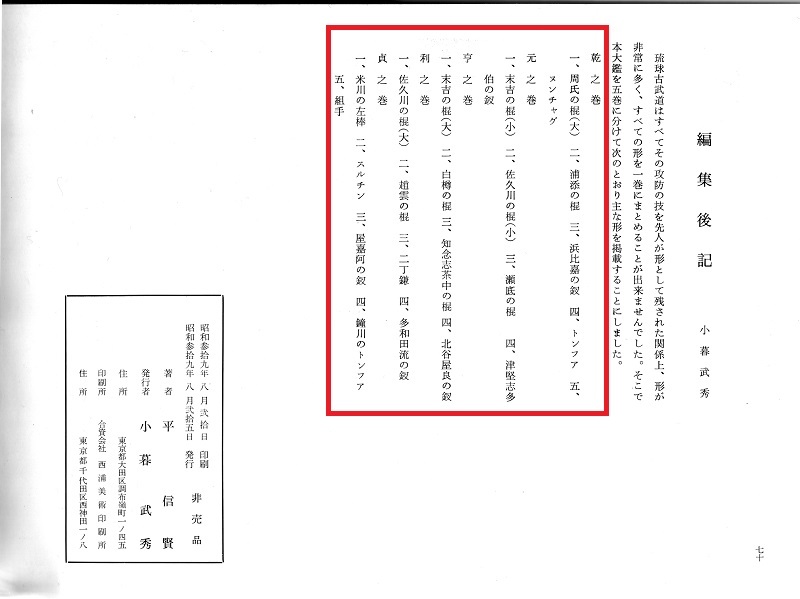 Let’s turn to the correction sheet, which gives the corrections for writing and printing errors detected at the time of publication in 1964: Line 5 of page 70 is corrected from Urasoe to Sesoko, and line 8 is corrected from Sesoko to Urasoe. The correction sheet, correcting Line 5 of page 70 from Urasoe to Sesoko, and line 8 from Sesoko to Urasoe. In other words, in the original edition, initially Urasoe no Kon had been specified. On the correction sheet this was corrected to Sesoko no Kon. Moreover, inside the actual book, in the headline of the kata on page 54, a paper slip bearing the printed characters for Sesoko was pasted over the original text. Paper slip saying “Sesoko no Kon” pasted over the original text. As I mentioned before, I am in the fortunate, unique, and expensive position of owning two specimens of the original 1964 edition of Taira’s Ryūkyū Kobudō Taikan. In both of these the paper slip with the printed characters for Sesoko are pasted on the headline on page 54. So I decided to remove the paper slip in one of the editions. It was not possible to do so nondestructively. So I heated the area, made it wet, and carefully scraped the paper slip off, hoping my in situ surgery would render the original text below intact. And it did. As it was to be expected, the original text read Urasoe. Summarizing the above, in the original 1964 edition of the Ryūkyū Kobudō Taikan (Kan no maki), the title of the kata on page 54 was initially specified as Urasoe no Kon. However, it was corrected to Sesoko no Kon, both on the attached correction sheet as well as on page 54 itself. In other words, he explains that the designation Sesoko no Kon in the original 1964 edition was a mistake, and that this kata is correctly labelled as Sueyoshi no Kon. And this was by no means a recent idea. In fact, in Inoue Motokatsu’s encyclopedic work (Ryūkyū Kobudō Vol. 2, 1974: 223-266), the one hundred and twenty-six techniques of Sesoko no Kon are described in detail with photos and text. And while there are some concords, this is simply not the kata as shown by Taira in his 1964 original edition. Finally, when looking up the eighty-eight techniques of Sueyoshi no Kon (Ryūkyū Kobudō Vol. 1, 1972: 201-230), it is exactly the same kata as shown by Taira in 1964. So it is Sueyoshi, not Sesoko. 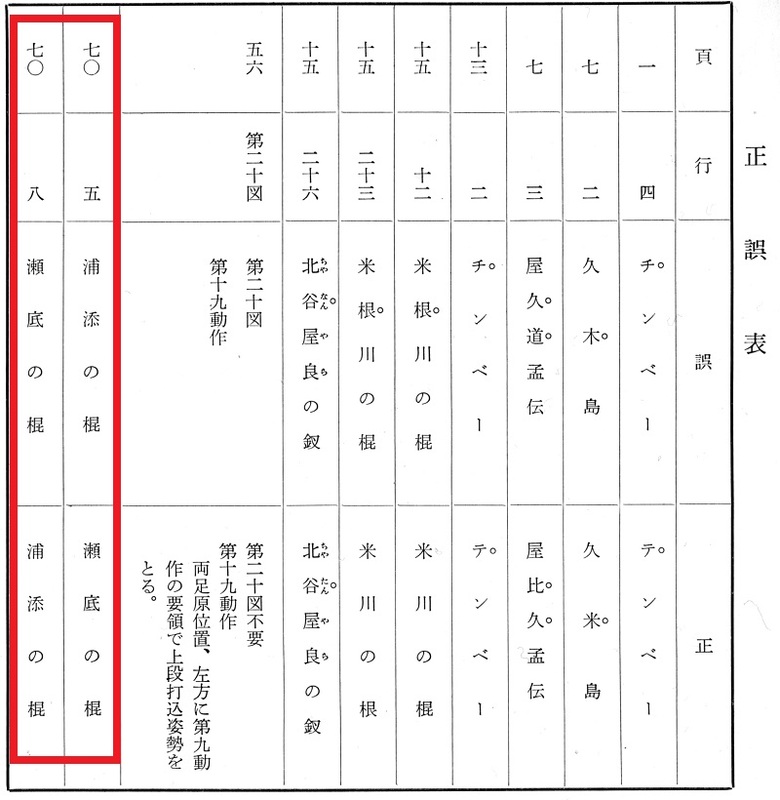 So the 1964 entries for Sueyoshi no Kon (Shō) and (Dai) have been corrected to Soeishi no Kon (Shō) and (Dai). As a side note which shows the confusion, you probably also noted that Sesoko no Kon (Vol. 2 – Gen no maki, Nr. 3) of Kata List 1 (original version of 1964) was corrected to Urasoe no Kon in Kata List 2 (corrected version of 1964), but that it was corrected back to Sesoko no Kon in Kata List 3 (corrected version of 1997). 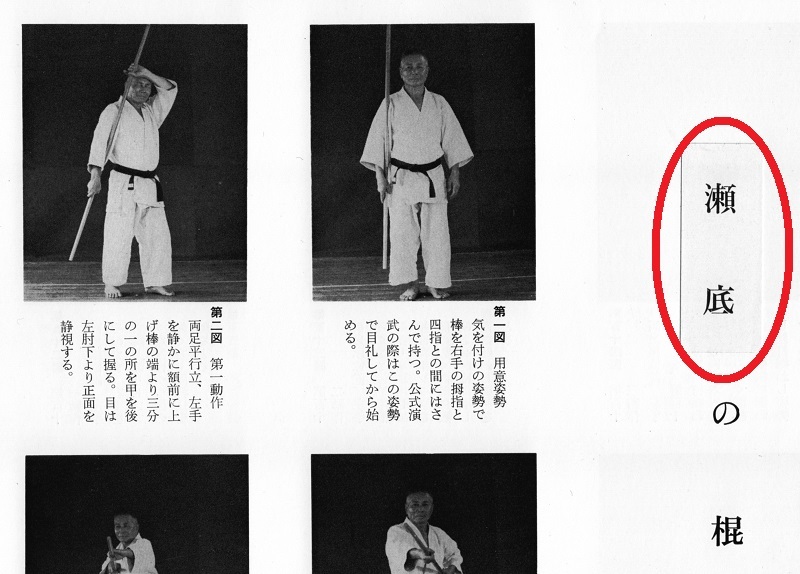 Now, I previously mentioned that Motokatsu Inoue only every published one single version of Sueyoshi no Kon in his encyclopedia, not two, and that he also taught only one single version of this kata. I also showed that this version of Inoue’s Sueyoshi no Kon is 100% identical with the kata presented on pages 54 – 65 of Taira’s original 1964 version. As shown above, this latter 1964 presentation of Taira had been mislabeled twice, first as Urasoe no Kon, and then as Sesoko no Kon. Whatever caused this confusion: this kata is what thousands of instructors and students of Taira lineage kobudō around the world refer to as Sueyoshi no Kon. It should furthermore be noted that an answer to the name might be found anywhere except in Okinawa: there, it seems, this kata, although found in name only in the kata lists of dōjō, had not in fact been handed down personally. Therefore, the comparison to Japanese mainland Taira lineages are the only means available. And with this we reach another extraordinariness, the description of the kata by Murakami Katsumi. Murakami Katsumi’s main teacher was Inoue Motokatsu, who in turn was a top student of Taira Shinken. As he was the first and only person to have ever received a 10th dan by Taira Shinken himself, some say Inoue was the actual heir to the system. Well, there was a lot of pushing and shoving among a number of venerable gentlemen both on the mainland as well as in Okinawa, but this is another story. Murakami Katsumi had not only been a student of Inoue Motokatsu, but also added three kobudō kata to Inoue’s 3 volume set on Ryūkyū Kobudō (see Vol. 3, 1974). In 1997, Murakami was also appointed advisor to Inoue’s association, the Ryūkyū Kobujutsu Hozon Shinkōkai, at that time and following the demise of Motokatsu led by his son Inoue Kishō. The following is, therefore, all the more astounding: When Murakami Katsumi’s work Okinawa Bojutsu was translated by Joe Swift and published in 2007, it included two cudgel traditions designated as Sueyoshi, namely Sueyoshi no Kon Shō (Murakami/Swift 2007: 79 – 88) and Sueyoshi no Kon Dai (Murakami/Swift 2007: 89 – 102). But, as noted by the translator Joe Swift, these two kata were called Soeishi no Kon Shō and Dai by Inoue Motokatsu. However, it seems Murakami maintained that he was taught these kata under the name of Sueyoshi. But, these two kata are what both Murakami’s teacher Inoue Motokatsu as well as his son Inoue Kishō clearly and unambiguously labelled Soeishi no Kon Shō and Dai, as also had been previously mentioned in this text. Here is a video of Murakami Sensei performing the kata in question. Although labelled Sueyoshi here, it is what the rest of his teacher Inoue’s group calls Soeishi no Kon Dai. 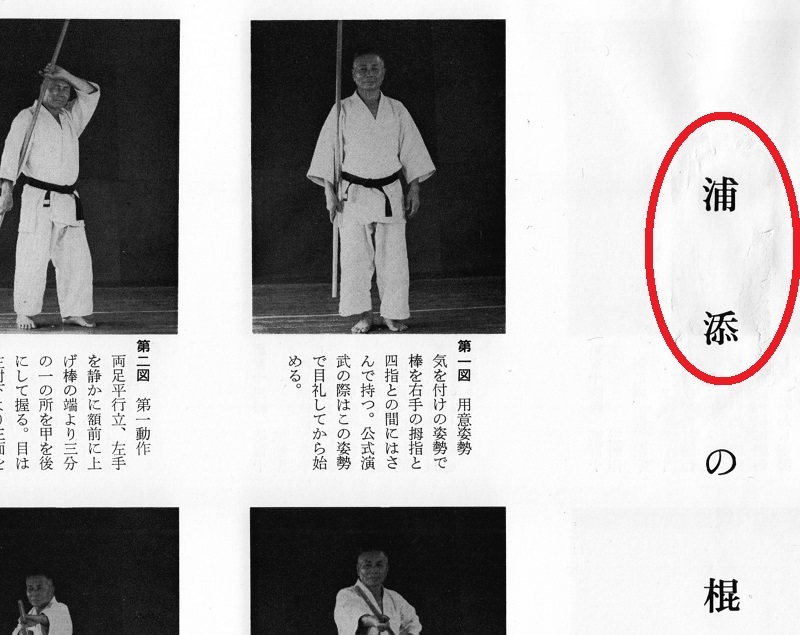 Another issue not really solved is related to the above: Within the kobudō syllabus of Shimabuku Tatsuo of Isshin-ryū is found a kata called Shīishi no Kon シーシヌクン. According to Arcenio Advincula and also other sources, Shimabuku Tatsuo learned this kata from Taira Shinken. However, there has been a discussion as to which kata the name Shīishi actually refers to, to Sueyoshi or to Soeishi. According to records kept by John Bartusevics, Shīishi no Kon was performed by Shimabuku Tatsuo in 1961-62, at an occasion were his friend Taira Shinken also participated as special guest and performed two kata (Urasoe no Kon and Hanta’gwa Kōra’gwa no Sai). Next, in a handout of the Agena Dōjō in 1963-64, the kata is listed as “Shue Yoshi No Kun.” The same name is found written in a photo from the Agena Dōjō in 1971 (photo by Charles H. Murray), and this sounds very much like Sueyoshi, rather than Soeishi. 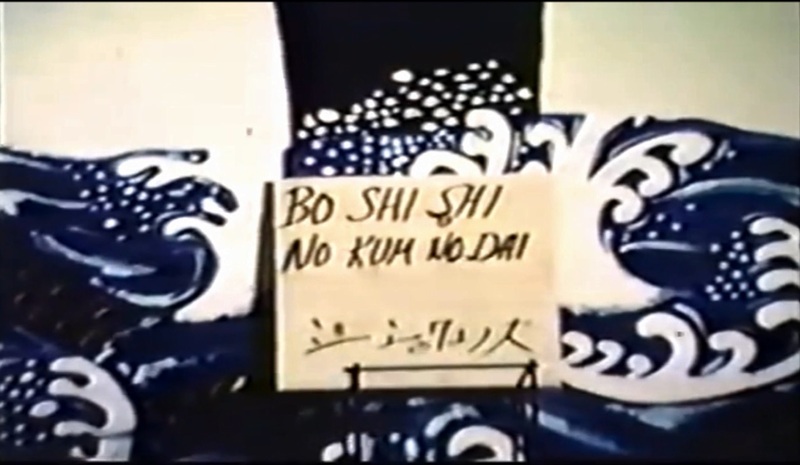 In 1966, in a film of Shimabuku Tatsuo made by Steve Armstrong, the kata is announced as Shīishi nu Kun Dai (see movie at minute 16:30). So what was the original name of Shīishi, what characters were used, and what was the kata Shimabuku Tatsuo learned from his friend Taira Shinken? As was shown earlier, there was a lot of confusion about the correct names even in Taira’s own publication still in 1964. Various kata names where mislabeled, and even the corrections were partially wrong. This is now 50 years ago. At the risk of repeating myself: I learned what has become called Sueyoshi no Kon firsthand by a 2nd generation student of Taira Shinken. I also studied kobudō with a Okinawan 2nd generation student of Taira Shinken. I studied in great detail Sueyoshi no Kon in practice as well as in comparison with the few publications by Taira Shinken and Inoue Motokatsu, as well as Soeishi no Kon Dai from the latter as well as from object-lesson by a teacher. I studied Soeishi no Kon of Taira lineage from Okinawa, which I am – however – not allowed to share anything about. This in addition to all the videos and websites everybody else has also seen. And while there is still much to discuss, like the name changes and their level of authenticity anyway, as regards the question what kata the Shīishi no Kon of Isshin-ryū originated from, there is only one answer: It is the kata today (!!!) referred to as Soeishi no Kon, or otherwise Soeishi no Kon Dai, depending on which Taira lineage you refer to. Finally, you might simply learn Sueyoshi no Kon and Soeishi no Kon. The proof of the pudding is in eating it. Reconstruction of Sueyoshi no Kon, from Taira Shinken 1964. This entry was posted in Bojutsu Kata Series and tagged Isshin-ryu, Kobudo, Shimabuku Tatsuo, Shishi no Kon, Soeishi no Kon, Sueyoshi no Kon, Taira Shinken, Urasoe no Kon. Bookmark the permalink.